Nadia Watts Interior Design is thrilled to announce that we have been selected for the Luxe Gold List for 2019. NWID was also recently featured in a Women in Business feature in Luxe- we’ve included a link to the article below! Hope your February is off to a good start and full of lots of love! Thank you, Luxe, for featuring NWID in your Women in Business feature! Click here to read more! D. Porthault’s timeless bedding is made true with this iconic pattern in lavender. It’s easy to fall in love with these sheets! Juliska is a favorite at NWID. The elegant lines and details to these heart shape plates make them acceptable dinnerware throughout the year, not just on February 14. I love the lines and shape of this Nambe Love Bowl. The almost distorted shape of the heart makes this bowl a unique and attention-grabbing addition to your table. With a touch of glitz and glam, this stunning art work would make a great addition to any space needing a bit more life. 2019 is here! We hope this year brings you joy and prosperity, and perhaps a remodel, refresh or even new pillows and paint! Enjoy this month’s “Watts your Favorite…” an ode to organizing. When it’s time to finally take down your Christmas tree, may I recommend one of these super handy ornament storage boxes from the Container Store? Keeping chest drawers organized is a constant battle, but these stylish and adjustable organizers will keep your drawers in check! Keeping my kids toys and crafts organized has never been easier with this colorful art caddy! Joseph Joseph makes clever and practical home appliances and accessories. These storage containers are both sleek and stackable giving you more countertop space and an appeasing look. Fall is here! Is it me, or as soon as Halloween arrives everyone starts talking about Thanksgiving and Christmas? Before the rush of holiday mayhem, let’s enjoy the fall season. This month on “Watts your favorite…” I’m sharing a few of my favorite textiles that remind me of fall! 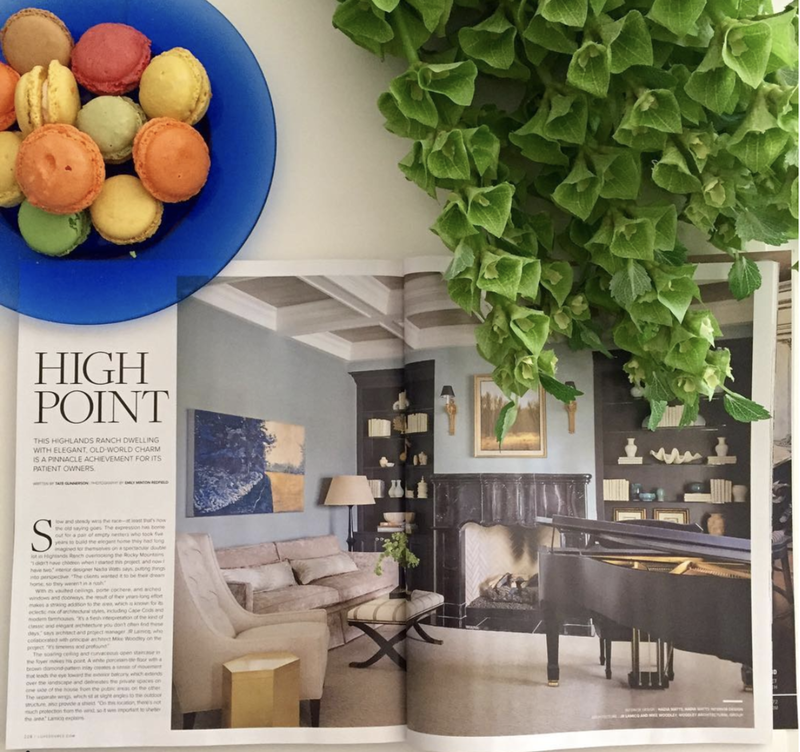 Thank you, 5280 Home for sharing a few of my favorite paint colors in your most recent issue! Click here to read the full article! Falling leaves? Check! Beautiful colors? Check! Ferrick Mason’s fun textiles come to life in this beautiful leafy print. The beautiful coral background of this embroidered fabric is the perfect addition to add warmth and depth to a room. We recently used this fabric on pillows at a recent project. The vibrant colors and storyline inspired print (with numerous animals and botanical shapes) makes this one of our new favorite prints! Kerry Joyce makes some of my favorite fabrics! This beautiful Sienna Rose color isn’t too orange, and it isn’t too pink- it is quite simply perfect. September is here! School is officially back in session, and yet summer is still happily lingering. While we prepare for the arrival of fall, we hope you’ll check out our Instagram feed (@nadia.watts) for daily updates on our recent projects. Scroll down to read this month’s “Watts your favorite…” focusing on staying organized to get you through September! Thank you, Colorado Homes & Lifestyle, for featuring this beautiful kitchen in your September/October issue. To see more click here. WATTS YOUR FAVORITE... ORGANIZATION TOOL? If you’re like me and prefer to see a calendar printed out in front of you instead of on your phone, then this calendar is right for you! It’s great for visualizing the entire upcoming year and it’s laminated so changes can be made. Time to upgrade your desk accessories? Look no further than this sleek and modern tape and stapler dispensers from the Container Store. Baskets are a great way to organize and hide clutter. Serena & Lily has a great selection of baskets in different shapes and colors perfect for every type of room. Is it me, or is the summer flying? We hope you enjoy our final installment of the summer series for “Watts your favorite…”. This month it’s all about outdoor décor! 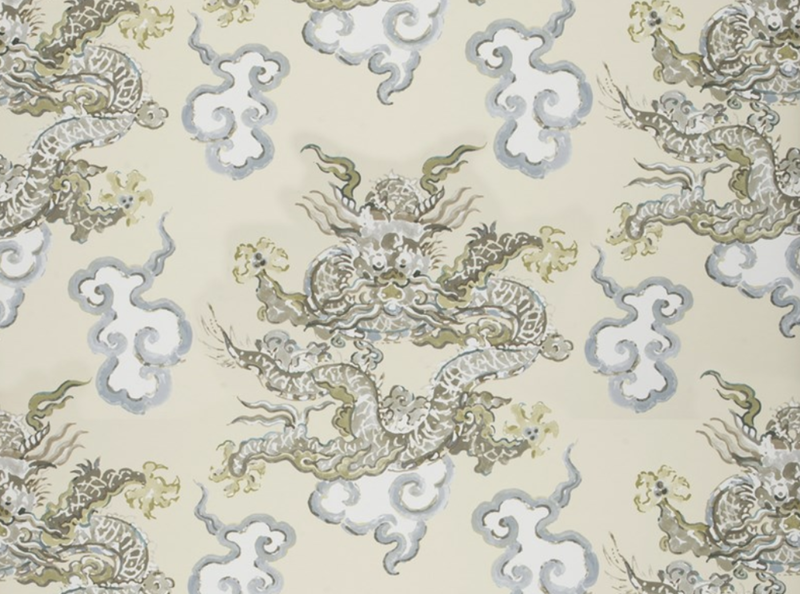 Thank you, Kravet, for featuring NWID in your most recent “Inspired. Kravet” blog post! Click here to read more! Love this simplistic, yet unique pattern to help give your outdoor space a lift! These planters, handcrafted in Vietnam, bring modern simplicity and design to any outdoor space. Perennials, known for the outdoor fabric, has an assortment of outdoor pillows perfect to fit your patio needs! These oversized hurricane lanterns are a statement piece for your outdoor tablescape! This statement birdhouse is one way to make sure your backyard birds are happy and stylish. June is here, and so is the official start of Summer! In honor of the season, for the next few months, I’ll be featuring my favorite outdoor furniture and décor ideas in “Watts your favorite…”. This month it’s my favorite outdoor chairs. 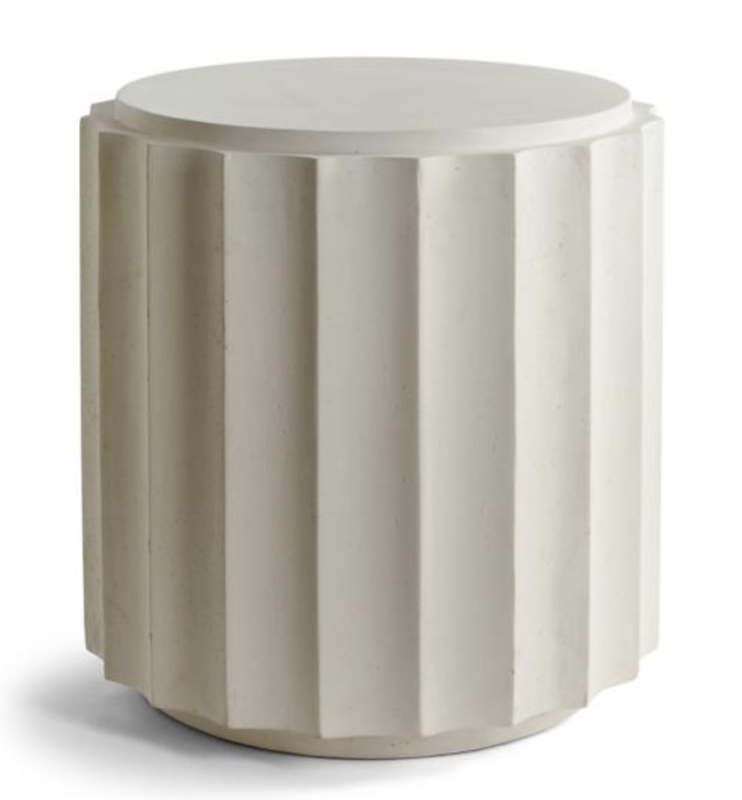 Make sure to scroll down to check those out, as well as our recent feature in Dering Hall! Thank you, Dering Hall, for featuring this stunning home in your House Tours editorial. To see more click here. WATTS YOUR FAVORITE... OUTDOOR CHAIR? Looking to add a pattern to your backyard? Look no further than this fun chair from West Elm. The classic Adirondack chair gets reimagined by World Market. The sleek contemporary lines and grey color adds a modern twist on the classic original chair. Now for something different! This is the perfect chair to add to a covered porch for a fun addition to your outdoor space. 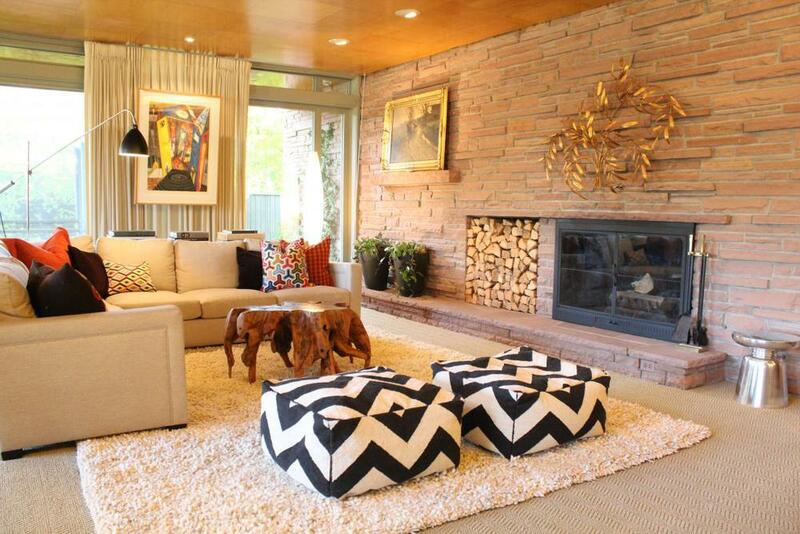 Add a few pillows with a pop of color and pattern and you’ll be ready to lounge. The sleek contemporary lines and bright color options makes Room&Board’s version of the chair a must have for modern spaces. Happy May! I’m back from Italy, feeling refreshed, inspired, and ready to hit the ground running on our projects at NWID. Make sure to scroll down to check out our Recent Mentions, Watts Your Favorite…Lamps, and details about the event I’m participating in at the Brass Bed in Cherry Creek North on Thursday, May 10. I hope to see you there! Bunny Williams can do no wrong! This classic lamp, also available in brown, is a steadfast addition to a classic, traditional space. Now for something very different! The floral design created by shells makes this lamp a standout décor item. Elegant and unique. I love how this lamp adds character to a room without overpowering the décor. Happy April! This month we are busy working on great projects we can’t wait to share with you soon! April is also the month of a trip I am taking with Kravet to have an exclusive tour of Florence, Italy. Make sure to follow the trip on Instagram (@nadia.watts)! Mark your calendars and join us for Defining Design, a wonderful fundraiser to support the Global Down Syndrome Foundation at the Brass Bed in Cherry Creek on Thursday, May 10 from 5:00-8:00pm. Click here for more details of the event. NWID has been selected as one of the six interior designers to design a bedding ensemble. The Brass Bed is extending a rare 20% discount on all sales during the three-hour event. Email rsvp@brassbedfinelinens.com to RSVP. WATTS YOUR FAVORITE... DECORATIVE MIRROR? Bold and with a lot of flare, this mirror is a statement piece and a great way to add color to your space! This mirror is definitely worth a second look! The ridges on this frame add character and drama to any space. Anyone else feeling a bit beachy? The beauty of this mirror is that beach or no beach, this mirror is a fun addition to any space. Spring is here! While the weather seems unpredictable this time of year, it’s hard not to get excited for flowering trees, spring blooms, and of course warmer weather. In honor of Spring’s arrival, I’m sharing my favorite Spring inspired floral fabrics in “Watts your favorite…” this month. 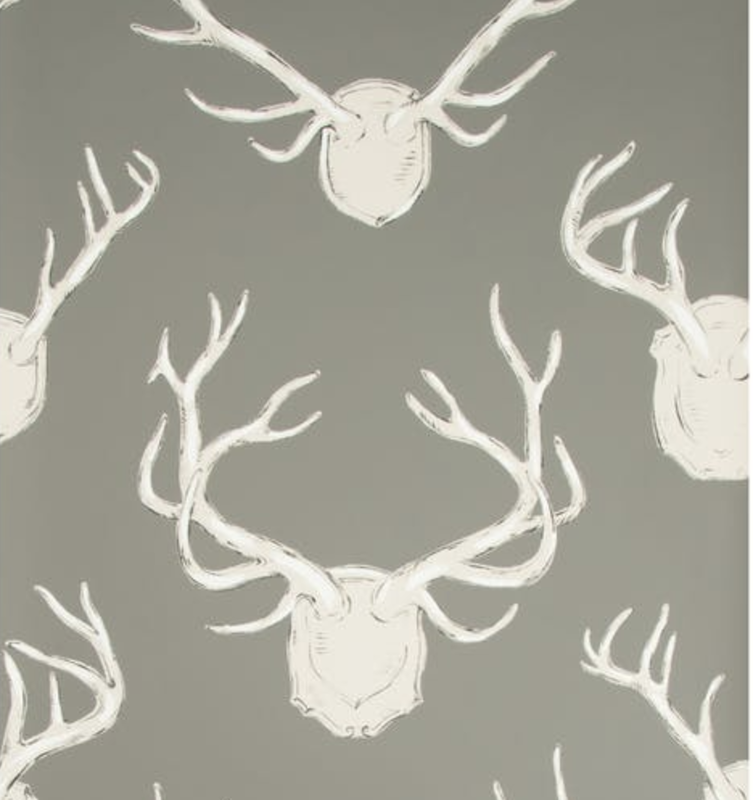 This print compliments a room needing something a bit more contemporary. I love the movement and variation in the design especially in this ‘dogwood’ colorway. Truly a gorgeous print! With a multitude of colors, this fabric is versatile, adding a pop of color into any space. Liberty London, known for their whimsical and bold prints, hits it out of the park with this beautiful floral. I love the variation of shapes in this print, especially the flowering buds. Thank you, Dering Hall, for featuring NWID in "27 Charming Pink & Red Rooms” and “30 Bathrooms with Standing Showers”. Click here to read the article! Dering Hall also shared one of Nadia’s Spring Decorating Tips. Click here to read the article! February is the month of many things: the Olympics, Valentine's Day, President’s Day, and weekend ski trips. At Nadia Watts Interior Design, February is all about kitchen remodels, new home layouts, and of course thoughtful decor and furniture design. Wishing you a great month with gold medals, love, and wallpaper selections. Thank you, Dering Hall, for featuring NWID in "33 Gorgeous Kitchens with Gold Accents". Click here to read the article! NWID won a Houzz award! Thank you, Houzz, for the award for Best Dining Rooms in Denver for 2018! Click here to see more. In need of height? These birds help give length and scope to a space, all while adding a bit of storytelling. These boxes are a perfect addition to any space. They can be arranged alone, but look great together. I love the whimsical, artistic application to these vases. Dramatic and thought provoking, this trio of vases is a sure standout in any space. I love this time of year and how it stirs up the feeling of starting something new. No matter what type of resolutions you may have for the year, we wish you every success. NWID is here to help you with any home resolutions you have for 2018! 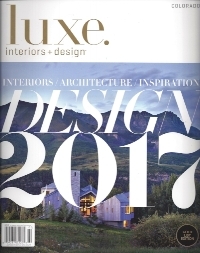 NWID is thrilled to be featured in Luxe Interiors + Design in the January/February 2018 issues! We loved working on this home and hope you will enjoy the article! Click here to read! NWID is excited to have submissions in this year's Luxe Red Reader's Choice Awards. Please click here and vote for NWID in four categories. In order to vote, you will need to create an account with Luxe. It’s a simple and quick process, and your support is greatly appreciated! Don't you just love this color combo? This sleek modern pendant comes in a variety of finishes and colors, giving any space a unique look. What about hanging two of these over your kitchen island? 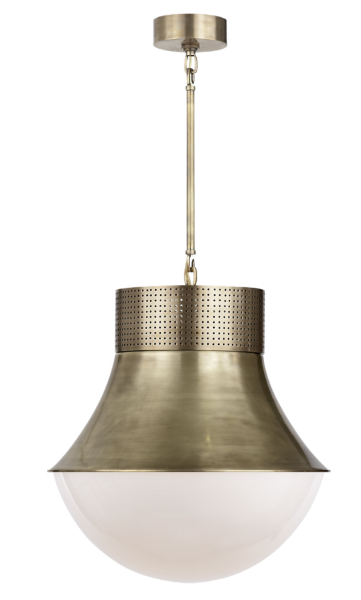 Designed by Kelly Wearster, this beautiful pendant commands the space especially in this antique-burnished brass finish. Looking for a little drama? I love how the detail cutouts at the edge of this pendant adds character and enough excitement to make this an eye catching work of art. As 2017 winds down, NWID is gearing up for a lot of exciting projects in the new year. We can't wait to share the progress in the upcoming months! Since it is a busy time of the year, I promise to keep this newsletter short and sweet. I’m sharing a blast from the past article from Colorado Homes & Lifestyles, October 2009, “I’m Dreaming of a White... Tablescape”. Click here to read some of my timeless holiday decorating tips. Scroll down for our reader's favorite section, “Nadia’s Favorite Things”. This month is my favorite fun wallpapers! NWID was thrilled to be listed in the November/ December 2017 issue of Colorado Homes & Lifestyles on their Fabulous List for 2017. To read more, click here! NWID was honored to be featured in the December 2017/January 2018, 5280 Home in Denver's Top Design for the entry! To read the full article click here! Fish anyone? I love the level of detail in each fish. The design and layout of the overall wallpaper makes this one of my favorite fun papers! 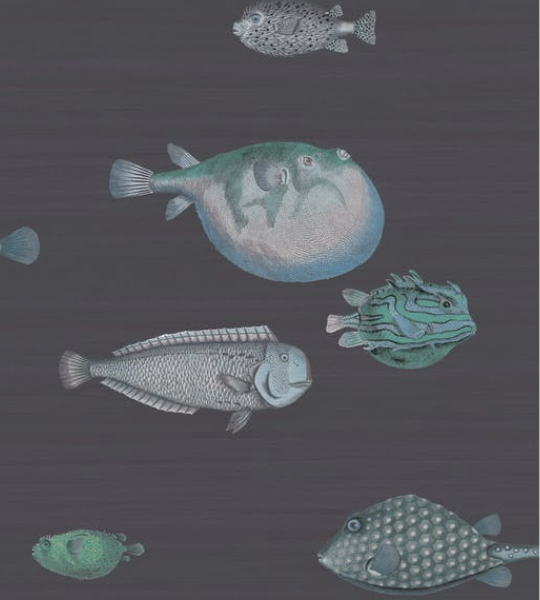 While Jim Thompson may be known for their beautiful silks, this wallpaper is a standout all on it's own. It's a whimsical dragon scene with movement and flow. It's a great addition to any space looking for excitement and energy. It's rustic, it's modern, it's chic, it's fun! I love how this wallpaper can be used in so many different types of rooms. From an updated home in the mountains, to a fun accent wall in a study. November has been a busy month at Nadia Watts Interior Design. With a home renovation and install behind us, and projects in the pipeline we are looking forward to the busy months ahead. On top of all of the fun projects we are working on, the holidays are right around the corner. If you're like me you're asking- What?! Thanksgiving? This week!? Where's my pecan pie recipe?! Before the week passes me by, I want to wish you all a Happy Thanksgiving! Whether you are a forever client who has worked with me for years and needed a few things reupholstered in their bedroom, or a new client looking for design work on a full scale home remodel, I want to say thank you. I grateful for your continued business and support. PS- scroll down below for my favorite Pecan Pie Recipe! Nadia Watts Interior Design is featured for the 6th year in The Scout Guide! Make sure to check out Nadia's feature in Volume 6 and other past volumes by clicking here. This carpet defines transitional design: 50% traditional 50% modern. The bold and bright color give this rug life and excitement. One of my favorite rugs! It's completely unexpected but the rich colors add so much warmth! And the thick pile makes this rug super comfortable! 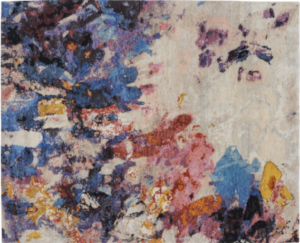 This bold impressionist inspired rug adds a dramatic accent to any room. Playful colors and neutral tones balance this piece making it a fun and dynamic addition. 2. Start with making a pie shell or buy one. them. Pour into the shell.